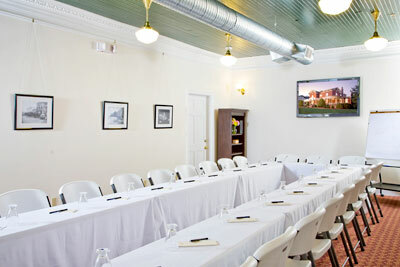 The Meeting and Event Center is located in our circa 1910 carriage house behind the bed and breakfast and offers space for corporate retreats, business meetings, training sessions, corporate workshops, and teleconferencing. The space has been hard wired with 15 data ports for Internet connectivity and also offers high-speed wireless Internet connections. There is a large flat-screen LCD TV to allow for speakers to present PowerPoint or other presentations. A separate break-out room is also available for smaller groups to work on their projects. In addition to being used as business meeting facilities, the venue also can be used for Virginia retreats, bridal luncheons, baby or wedding showers, teas, catered luncheons, LAN (gaming) parties, small weddings, wine tastings, sweet 16 birthday parties, quilting workshops, scrapbooking retreats, and any other activity that requires an open space with good lighting and ample table space. 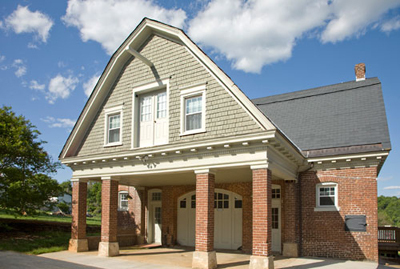 Great care was taken to preserve the architectural integrity of the Carriage House during the renovations. The original hardwood ceilings in the entry foyers, stables, and carriage room were preserved. The wood from the walls separating the stables from the carriage room was used as wainscoting in the break-out room. Antique light fixtures as well as school house lights illuminate the space and keep the ambience of the period intact. If you are looking for an intimate space that doesn’t have the look or feel of a hotel ballroom and has all the amenities that you expect when booking the finest space, then consider holding your next event at the Meeting and Event Center at The Carriage House Inn Bed and Breakfast just blocks from historic downtown Lynchburg, VA. If you will be staying overnight while using the rooms in the Meeting and Event Center, the upper level of the Carriage House has been transformed into two luxury suites, both with California king beds as well as an antique full bed or daybed. Each suite has a private bath with a separate shower as well as an antique claw-foot tub. In addition, there is a common room off each of the suites as well as a kitchenette. Our legendary breakfast is included for our overnight guests in the main dining room of the bed and breakfast. Other guest rooms are available in our restored 1878 mansion. See accommodations for more information on booking one of our guest rooms. Call Kathy or Mike at 434.846.1388 to book your next event or for more information. Please note that due to restrictions placed on us by the City of Lynchburg in our special use permit we are only able to handle small venues without special permission from the Planning Commission.